This is one of a group of four images in Figure S5 in Apaja et al., JCB 2010, that support the conclusion that the WT vasopressin type2 receptor (V2R) and the V2R W164S mutant (that causes nephrogenic diabetes insipidus) have different post-endocytic targeting. The sorting of endocytosed myc-tagged WT and W164S V2R was determined by indirect immunolabeling of internalized receptors in transiently transfected COS7 cells. The WT and temperature (26 degrees C) rescued mutant receptors were labelled with anti-myc Ab in live cells (1h) and then chased in Ab-free medium (1h, 37 degrees C) before indirect immunolabeling. To mark lysosomes, cells were labeled with 10 kD Texas red–dextran at 50 µg/ml by overnight fluid-phase endocytosis and chased for >3 h at 37°C. Fluorescence micrographs were obtained by a microscope (LSM510 or LSM710; Carl Zeiss, Inc.) equipped with a Plan-Apochromat 63×/NA 1.4 objective in multitrack mode. 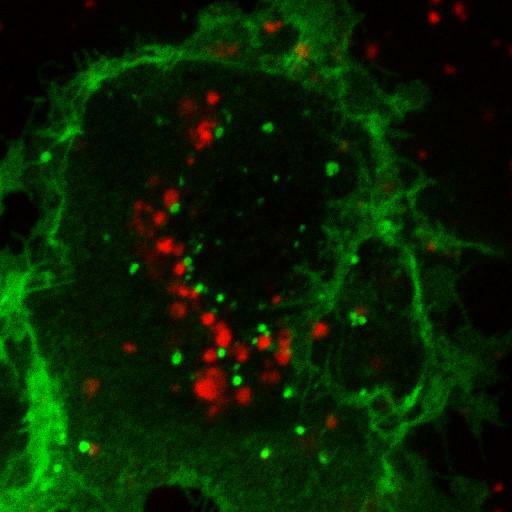 This single optical section shows that the WT V2R does not co-localize with lysosomes. A companion image shows that the internalized W164S V2R mutant, however, does co-localize with lysosomes.